Figure 5-5. 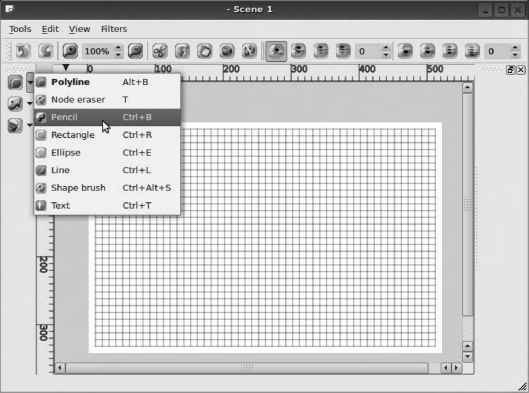 The drawing tools in KToon allow the construction of basic shapes. Figure 5-6. 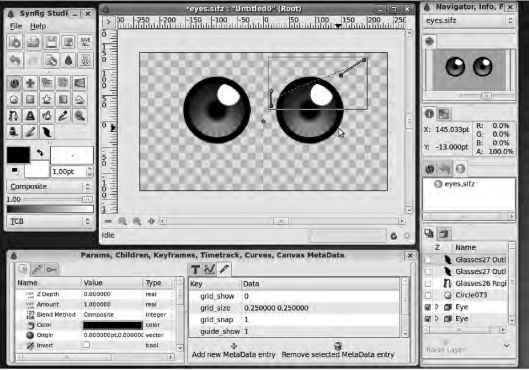 The Line and various shape tools produce steadier results than the freehand Pencil tool. One of the current limitations of KToon is that it's difficult to see what you're drawing. The line or shape isn't visible while the mouse button is held down—only when you release it, which means you have to feel your way around the canvas. If you make a mistake that Edit > Undo can't fix, you can use the Selection tool to click and drag the mouse pointer around an object. The selection is highlighted with small blue squares in its corners. You can then press Ctrl+X, the usual keyboard shortcut for Cut, or the Delete key. When you have a first drawing that you're happy with, click the middle icon of the three arranged vertically on the far right side of the main KToon window. Doing so opens the Exposure Sheet dialog, which provides an overview of the individual frames in the project (see Figure 5-7). 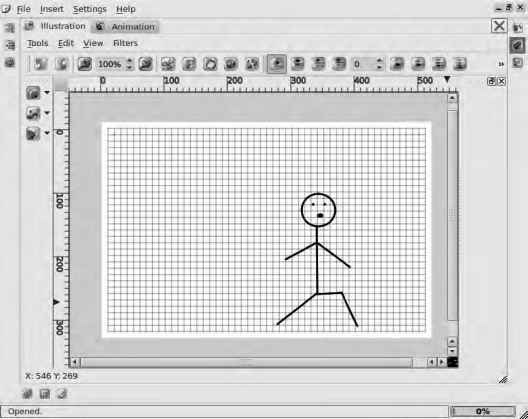 Right-click your first image, which is labeled Drawing 1 by default, and select "Clone this Frame." A pop-up window asks how many cloned frames you require; 23 clones, to create a total of one second in your movie, may be a good number to start with. All 24 frames are labeled Drawing 1 in the Exposure Sheet dialog, but you can rename each frame by double-clicking its name. Any changes you make to the original drawing are automatically applied to all of its clones. Figure 5-7. The Exposure Sheet dialog lists all the frames that make up the animation project. Of course, if all the frames are identical clones, there isn't much going on in the animation. In the Exposure Sheet dialog, right-click the name of one of the frames you've already created, and select "Copy this Frame." If you click in one of the empty frame spaces below, a new frame is created automatically. Right-click its name, and select "Paste into this Frame." Unlike when cloning, you can modify this new frame without affecting the clone frames you made earlier. After you've added a few different frames to the Exposure Sheet, click the Animation tab at the top of the main KToon window. The Render Camera Preview opens, which has Rewind, Play, Stop, and Fast Forward buttons. Click the Play button for a first look at your animation (see Figure 5-8). Figure 5-8. 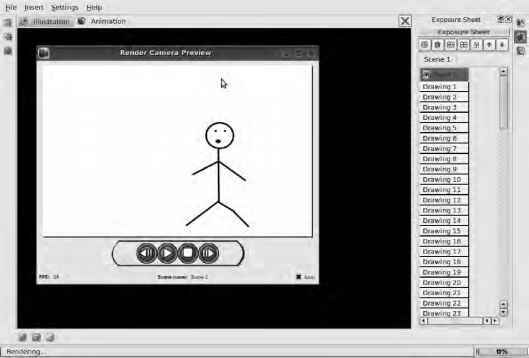 The Render Camera Preview window helps test how your animation is progressing. If it's very short, you may want to select the Loop check box in the lower-right corner to see the animation over and over again. Click the Stop button if your animation is still looping, and then click the Illustration tab to switch back to Editing mode. What is pen tablet ktoon?